Regardless of the gender and post you join at the Air Force, all males and females will be treated a like. So how does it affect the everyday woman, how do they survive and how does and everyday woman turn into war fighting personnel in a couple of weeks? All new recruits to the Air Force go through the same basic trainings regardless if you join as an active duty Air Force member, reserves member or even as a national guard. Honestly speaking, families tend to worry on the fact that their loved ones leaving home, joining the Air Force and been deployed some place remote miles away from home. There’s nothing more saddening than the act of informing your family members to be prepared for any shocking calls and that they cannot contact you directly if any emergency occurs immediately. The effect on this has a greater impact towards the women folk for some reason. This is why it takes real guts and commitment for a lady to be daring in a man’s world. This article is for the women out there who needs a birds eye on women been in the Air Force. At the arrival you will be with basic civilian clothing. Knowingly or unknowingly if your clothing has logos or pictures in it, you will be required to wear it inside out to make it discreet. A key survival point would be to be silent and not make yourself known. The first few days at the military fitness programs will be the hardest as you and your team will be yelled at for anything that you’re supposed to do but not done and anything that you did but not supposed to do. 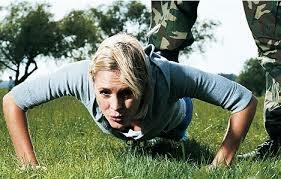 The morning before the military fitness programs starts you will be granted with scarce time to be ready. You will be assigned to a partner and will be required to carry out the morning routine accordingly. However it’s always best to be able to do it own your own than depend on a partner as you are bound to be yelled at in case if they are not paying attention. Behavior is strictly looked upon and any misbehaviors if found will be taken immediate action and punishments granted. You can go over at this site to know more information about the fitness programs that the forces go through. Women are not supposed to be talking to brother teams and if found to be flirting will be sent back a week or two. During the second or third week of the training a pregnancy test will be carried out and of course you will be sent home if found so.